^ 1.0 1.1 1.2 1.3 1.4 M 33 – Galaxy. SIMBAD. Centre de Données astronomiques de Strasbourg. [2009-11-28]. ^ 2.0 2.1 2.2 Results for NGC 598. NASA/IPAC Extragalactic Database. NASA/IPAC/JPL. [2006-12-01]. ^ 3.0 3.1 3.2 Bonanos, A. Z.; Stanek, K. Z.; Kudritzki; Macri; 等. The First DIRECT Distance to a Detached Eclipsing Binary in M33. Astrophysics and Space Science. 2006, 304 (1–4): 207–209. Bibcode:2006Ap&SS.304..207B. doi:10.1007/s10509-006-9112-1. ^ 4.0 4.1 Magrini, Laura; Stanghellini, Letizia; Villaver, Eva. The Planetary Nebula Population of M33 and its Metallicity Gradient: A Look Into the Galaxy's Distant Past. The Astrophysical Journal. May 2009, 696 (1): 729–740. Bibcode:2009ApJ...696..729M. arXiv:0901.2273. doi:10.1088/0004-637X/696/1/729. ^ 5.0 5.1 5.2 Brunthaler, Andreas; Reid, Mark J.; Falcke, Heino; Greenhill, Lincoln J.; 等. The Geometric Distance and Proper Motion of the Triangulum Galaxy (M33). Science. 2005, 307 (5714): 1440–1443. Bibcode:2005Sci...307.1440B. PMID 15746420. arXiv:astro-ph/0503058. doi:10.1126/science.1108342. ^ O'Meara, S. J. The Messier Objects. Cambridge: Cambridge University. 1998. ISBN 0-521-55332-6. ^ NASA Spitzer Telescope Reveals Pinwheel Galaxy's Hidden Wonders. [2007-04-07]. ^ SIMBAD Astronomical Database. Results for Messier 101. [2007-04-07]. ^ Messier Object 101. [2007-04-07]. ^ Best of AOP: M101: Pinwheel Galaxy. [2007-04-07]. ^ 11.0 11.1 Bortle, John E. The Bortle Dark-Sky Scale. February 2001 [2010-01-07]. Naeye, Robert. A Stellar Explosion You Could See on Earth!. NASA's Goddard Space Flight Center. March 21, 2008 [2010-04-13]. Christensen, Lars Lindberg; Zezas, Andreas; Noll, Keith; Villard, Ray. Hubble photographs grand spiral galaxy Messier 81. ESA. May 28, 2007 [2010-06-15]. ^ Skiff, Brian. Messier 81 naked-eye. sci.astro.amateur. January 10, 1997 [2010-02-11]. ^ Wilson, Barbara; Mitchell, Larry. The Revised AINTNO 100. Astronomy-Mall. [2010-02-11]. ^ Fodera-Serio, G.; Indorato, L.; Nastasi, P. Hodierna's Observations of Nebulae and his Cosmology. Journal of the History of Astronomy. February 1985, 16 (1): 1–36. Bibcode:1985JHA....16....1F. ^ Jones, Kenneth Glyn. Messier's nebulae and star clusters. The Practical astronomy handbook series 2nd (Cambridge University Press). 1991: 366. ISBN 0-521-37079-5. ^ Mullaney, James. The Herschel objects and how to observe them. Astronomers' Observing Guides (Springer). 2007: 16–17. ISBN 0-387-68124-8. ^ Van den Bergh, Sidney. The galaxies of the Local Group. Cambridge astrophysics series 35. Cambridge University Press. 2000: 72. ISBN 0-521-65181-6. ^ Triangulum Galaxy Snapped by VST. ESO Press Release. [7 August 2014]. ^ Michon, Gerard P. Sizing up the Universe - Stars, Sand and Nucleons. [2010-01-07]. ^ Corbelli, Edvige. Dark matter and visible baryons in M33. Monthly Notices of the Royal Astronomical Society. June 2003, 342 (1): 199–207. Bibcode:2003MNRAS.342..199C. arXiv:astro-ph/0302318. doi:10.1046/j.1365-8711.2003.06531.x. ^ Karachentsev, I. D.; Karachentseva, V. E.; Hutchmeier, W. K.; Makarov, D. I. A Catalog of Neighboring Galaxies. Astronomical Journal. 2004, 127 (4): 2031–2068. Bibcode:2004AJ....127.2031K. doi:10.1086/382905. ^ Karachentsev, I. D.; Kashibadze, O. G. Masses of the local group and of the M81 group estimated from distortions in the local velocity field. Astrophysics. 2006, 49 (1): 3–18. Bibcode:2006Ap.....49....3K. doi:10.1007/s10511-006-0002-6. ^ McConnachie, A. W.; Irwin, M. J.; Ferguson, A. M. N.; Ibata, R. A.; 等. Determining the location of the tip of the red giant branch in old stellar populations: M33, Andromeda I and II. Monthly Notices of the Royal Astronomical Society. May 2004, 350 (1): 250. Bibcode:2004MNRAS.350..243M. arXiv:astro-ph/0401453. doi:10.1111/j.1365-2966.2004.07637.x. ^ 26.0 26.1 Zhang, J. S.; Henkel, C.; Guo, Q.; Wang, H. G.; 等. On the Nuclear Obscuration of H2O Maser Galaxy. Astrophysical Journal. 2010, 708 (2): 1528–1536. Bibcode:2010ApJ...708.1528Z. arXiv:0912.2159. doi:10.1088/0004-637X/708/2/1528. ^ Finley, Dave. Neighbor galaxies may have brushed closely, astronomers find. National Radio Astronomy Observatory. June 11, 2012 [2012-06-13]. ^ Pawlowski, Marcel S.; Kroupa, Pavel; Jerjen, Helmut. Dwarf galaxy planes: the discovery of symmetric structures in the Local Group. Monthly Notices of the Royal Astronomical Society. 2013, 435 (3): 1928–1957. Bibcode:2013MNRAS.435.1928P. arXiv:1307.6210. doi:10.1093/mnras/stt1384. ^ Miller, Bryan W.; Dolphin, Andrew E.; Lee, Myung Gyoon; Kim, Sang Chul; 等. The Star Formation History of LGS 3. The Astrophysical Journal. December 2001, 562 (2): 713–726. Bibcode:2001ApJ...562..713M. arXiv:astro-ph/0108408. doi:10.1086/323853. ^ Buta, Ronald James; Corwin, Harold G.; Odewahn, Stephen C. The de Vaucouleurs atlas of galaxies. Cambridge University Press. 2007: 1–16, 88. ISBN 0-521-82048-0. ^ 31.0 31.1 31.2 31.3 Heyer, Mark H.; Corbelli, Edvige; Schneider, Stephen E.; Young, Judith S. The Molecular Gas Distribution and Schmidt Law in M33. The Astrophysical Journal. February 2004, 602 (2): 723–729. Bibcode:2004ApJ...602..723H. arXiv:astro-ph/0311226. doi:10.1086/381196. ^ 32.0 32.1 32.2 32.3 32.4 Verley, S.; Corbelli, E.; Giovanardi, C.; Hunt, L. K. Star formation in M 33: multiwavelength signatures across the disk. Astronomy and Astrophysics. January 2009, 493 (2): 453–466. Bibcode:2009A&A...493..453V. arXiv:0810.0473. doi:10.1051/0004-6361:200810566. ^ 33.0 33.1 Cioni, Maria-Rosa L. The metallicity gradient as a tracer of history and structure: the Magellanic Clouds and M33 galaxies. Astronomy and Astrophysics. November 2009, 506 (3): 1137–1146. Bibcode:2009A&A...506.1137C. arXiv:0904.3136. doi:10.1051/0004-6361/200912138. ^ Zloczewski, K.; Kaluzny, J.; Hartman, J. Photometric Survey for Stellar Clusters in the Outer Part of M33. Acta Astronomica. March 2008, 58: 23–39. Bibcode:2008AcA....58...23Z. arXiv:0805.4230. ^ Hernández-López, I.; Athanassoula, E.; Mújica, R.; Bosma, A. M33: The existence of a bar. A Long Walk Through Astronomy: A Celebration of Luis Carrasco's 60th Birthday, Revista Mexicana de Astronomía y Astrofísica (Serie de Conferencias): 160–162. November 2009. Bibcode:2009RMxAC..37..160H. 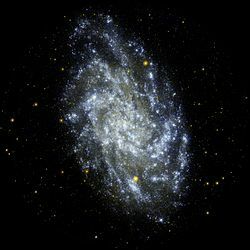 ^ Dubus, G.; Charles, P. A.; Long, K. S. High resolution Chandra X-ray imaging of the nucleus of M 33. Astronomy and Astrophysics. October 2004, 425 (1): 95–98. Bibcode:2004A&A...425...95D. arXiv:astro-ph/0406310. doi:10.1051/0004-6361:20041253. ^ Merritt, David; Ferrarese, Laura; Joseph, Charles L. No Supermassive Black Hole in M33?. Science. August 10, 2001, 293 (5532): 1116–1118. Bibcode:2001Sci...293.1116M. PMID 11463879. arXiv:astro-ph/0107359. doi:10.1126/science.1063896. 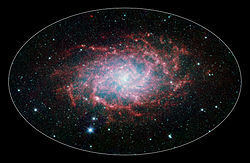 ^ Buczilowski, U. R. A multifrequency radio continuum survey of M33. II – Thermal and non-thermal emission. Astronomy and Astrophysics. October 1988, 205 (1–2): 29–40. Bibcode:1988A&A...205...29B. ^ Williams, Benjamin F.; Dalcanton, Julianne J.; Dolphin, Andrew E.; Holtzman, Jon; 等. The Detection of Inside-Out Disk Growth in M33. The Astrophysical Journal Letters. April 2009, 695 (1): L15–L19. Bibcode:2009ApJ...695L..15W. arXiv:0902.3460. doi:10.1088/0004-637X/695/1/L15. Hodge, Paul. The Spiral Galaxy M33. Astrophysics and Space Science Library 379. Springer Science+Business Media. 2012. ISBN 978-94-007-2024-4. OCLC 757338008. doi:10.1007/978-94-007-2025-1. Balcells, Marc; Szymanek, Nik; Merrifield, Michael. M33 – Triangulum Galaxy. Deep Sky Videos. Brady Haran.